Bring your picnic blankets and chairs to St. Francis Seraph Church this Saturday, April 30 for a community support picnic in Over-the-Rhine. The picnic will be held from 1pm to 5pm in the Franciscan Secret Garden to benefit two victims of a shooting incident that took place at Tucker’s Restaurant earlier this year. City residents and businesses have rallied around the victims’ families for this event, and free local entertainment will be provided by Wild Mountain Berries, Robin Lacey & Dezydeco, and Chico & Friends. Free food will also be provided from Over-the-Rhine establishments, and Christian Moerlien beer will be available for $3. Raffles, split the pot fundraisers and a silent auction will benefit the victims’ families. Event organizers say that prizes will include theater and concert tickets, restaurant and bar gift certificates, and more. Organizers are requesting a minimum donation of $10 at the door. All proceeds will go to Carla Tucker and Ronisha Burgin, the victims of a January shooting at Tucker’s Restaurant. Free parking will be available in St. Francis Seraph parking lot (map), and an indoor location, in case of rain, has been set aside next door at St. Francis Seraph School. 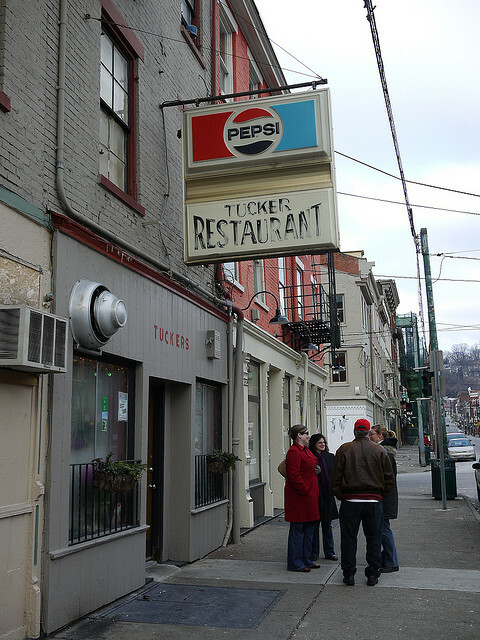 Tucker’s Restaurant exterior photograph by 5chw4r7z.